At Amy Jayne Aesthetics, I offer safe and virtually painless hair removal using an advanced laser system by Lynton. This treatment is suitable for all skin types and is one of the most comfortable laser hair removal option available. It is one of our most popular treatments, with patients visiting the clinic from throughout Kent and the Southeast. IPL stands for intense pulsed light, and it is a form of light therapy, used for various dermatological procedures including hair removal. Unlike laser treatments, which have just one specific wavelength, IPL has multiple wavelengths that scatter within the skin. 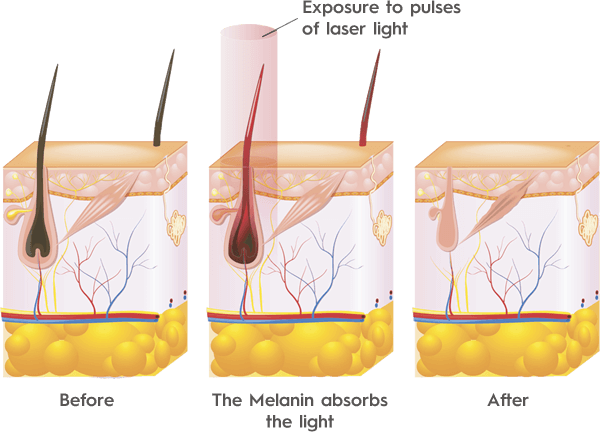 Light is selectively absorbed by melanin, the pigment in the hair follicle. This light energy heats the pigment within the hair and effectively destroys the hair follicle, preventing it from growing back, without damaging the surrounding cells. IPL hair removal is permanent. The hairs that are removed during treatment will not return. It is worth noting that due to the normal hair growth cycle, it is possible for dormant hair follicles to produce new hairs, these will be finer than the original hairs though. Can my hair colour be treated? All hair colours can be treated other than white and grey hairs. The darker the hair colour, the more light is absorbed, so is more easily treated. With IPL hair reduction, the precise wavelength of the light can be tailored to your hair colour to achieve the best results. Treatment sensation varies but is often described as “a flick of an elastic band”. Typically no anaesthesia is required and most clients describe the discomfort as moderate and tolerable. Due to the nature of the treatment, the lighter your skin type, the darker your hair, the better the result. As IPL hair reduction works by heating up the pigment within a hair, epilation, plucking, shaving and waxing should be avoided up to 4 weeks prior to your treatment. For the initial consultation and patch test your hair growth should be around 1 to 2mm in length, and when it comes to your actual treatment please shave beforehand. I don’t want any hair in the area when it comes to your treatment. You should avoid tanning or exposure to UV light 1 month before your treatment, and up to 1 week after your treatment. If you are unsure as to how best to prepare for your treatment, give me a call and I will happily advise you. IPL hair reduction is perfectly safe so other than protective glasses, no other special precautions are needed. The skin may be red immediately after treatment and the hair follicles may be swollen and bumpy but this usually subsides within a few hours. Adverse reactions are rare but may include a small blister or temporary lightening or darkening of the skin. The treatment is non-invasive so most clients experience no side-effects at all. 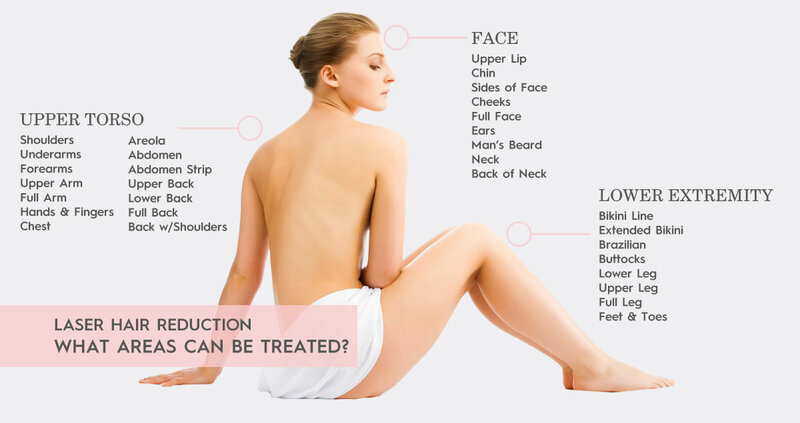 The treatment time varies depending upon the part of the body being treated. Typically, the face takes around 15 to 20 minutes, and full legs take 1 to 2 hours. Do I need several treatments? Only hair that is actively growing is affected, therefore multiple treatments are needed. Treatment is conducted every 4 – 8 weeks, depending on the area treated, until a satisfactory result is seen. The required number of treatments varies due to several factors such as an individual’s growth cycle, area of the body, hair density, thickness, ethnic origin, hormonal status and age. Typically 6 or more treatments are needed for the very best results. IPL hair reduction is permanent. The hairs which are destroyed during your treatment will never return. Your skin does contain dormant hair follicles, so it is possible for new hairs to appear during the growth cycle (although these will be much finer than your original hairs). There are several other factors such as hormonal imbalances which can also affect the overall results, in these cases, several treatments may be necessary. Most clients need no post-treatment care. If you have very sensitive skin, you may benefit from applying an aloe vera based product to the treated area of your skin for a few days after your treatment. It is also advised that you avoid direct sunlight exposure to the treated area for a few weeks following your treatment. The use of a sunscreen with a protection factor above 30 is also advised.